Trabon MGO Divider Valves from MotionSource keep your largest and most demanding machines running trouble-free. When critical bearings are hard at work on your largest machine tools, the Trabon MGO divider valve line of centralized and automatic lubrication systems is delivering precise amounts of lubricant at frequent intervals to every lube point–even in hard to reach areas. 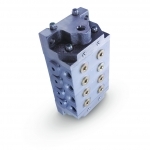 Trabon MGO Divider Valves are in stock at MotionSource and ready to ship. Order Today-Ship Today at MotionSource. Order Today, Ship Today. Trabon MGO divider valves are in stock and available for same day shipping.